Polenta is the ultimate Italian comfort food–creamy and soft. It can be served with a variety of accompaniments: some sausages in red wine sauce (my mother’s way of serving it); alongside calves liver alla Veneziana (one of my neighbor Beppi’s ways of serving it). It goes best with something moist and saucy, although it’s great simply with some gorgonzola cheese melting onto it. It’s also great for breakfast with butter and honey drizzled on top. The task of making polenta might seem daunting because traditionally, it took a lot of stirring to make a smooth perfect porridge. Many people (as well as restaurants) use intant polenta, which, in my opinion lacks the texture and full cornmeal flavor of the long-cooking variety. Beppi makes instant polenta, but he cooks and stirs it for about twenty minutes. He usually makes it ahead of time and cuts off slices of it and broils them ’til their golden and blistering on top. My mother always made the polenta and served it immediately as a porridge and I must say, I’m partial to the porridge experience, rather than the broiled slab experience. She also spent about forty minutes stirring the polenta constantly before pronouncing it done. My mother figured out a long time ago, that starting the polenta in cold water and bringing the mixture to a boil was good method of insuring that there would be no lumps in the finished dish. Most Italians wouldn’t approve of starting polenta in cold water–the traditional way to begin the dish is to slowly drizzle a fine stream of polenta into boiling water. No one can tell me exactly why this is so important, and I’ve had it both ways many times and can’t tell the difference between the two. Therefore, my polenta begins in cold water with a bit of salt. The proportion of water to cornmeal is 5 to 1. Usually I like to make 2 cups of cornmeal (and 10 cups of water), because I like to have it leftover the next day. I’ve devised a great no-fuss method of starting the polenta on the stove, then moving it to the oven to bake at 300 degrees for about an hour with minimal fussing. Just look in on it 2 or 3 times during that period and give it a stir (some of it will stick to the bottom of the pot, but that’s normal–just keep stirring it and try to loosen as much off the bottom as possible every time. The amount of time it takes depends on what kind of cornmeal you’re using. It’s best to use a coarse cornmeal–it need not be labeled “polenta“–you can use Quaker cornmeal just as well as imported cornmeal. The coarser the meal, the longer you’ll have to cook it. You’ll know when it’s cooked by its texture and appearance. It will begin to pull away from the sides of the pot as you stir it. It will no longer have that raw cornmeal flavor. I always allow an hour from start to finish, and insist on serving it as soon as it’s cooked. It can be reheated, but once it cools, it’s difficult to bring it back to the porridge state. The pollo part of this dish is a simple oven roast of chicken thighs, which I learned from Beppi. It’s simpler than a stew because it makes its own sauce without adding any liquids. Early in the day, I seasoned the thighs with salt, pepper, rosemary and olive oil, then placed them in a baking dish over some sliced onions and garlic. They marinate in the fridge until I’m ready to cook them. When I’m ready, the baking dish goes right into the oven from the fridge. The dish should be small enough to hold the thighs snugly without any space around them. The reason for this is that the thighs will form a bit of juice on their own and bake right in their own juice. If the baking dish is too broad or low, you’ll lose the juice. They start out under the broiler and then finish baking after they’ve begun to brown. This gives them a golden exterior first, then cooks them through, along with the garlic and onions underneath them–it’s a brilliant dish that can be entirely prepared ahead, then thrown in the oven at the last minute. 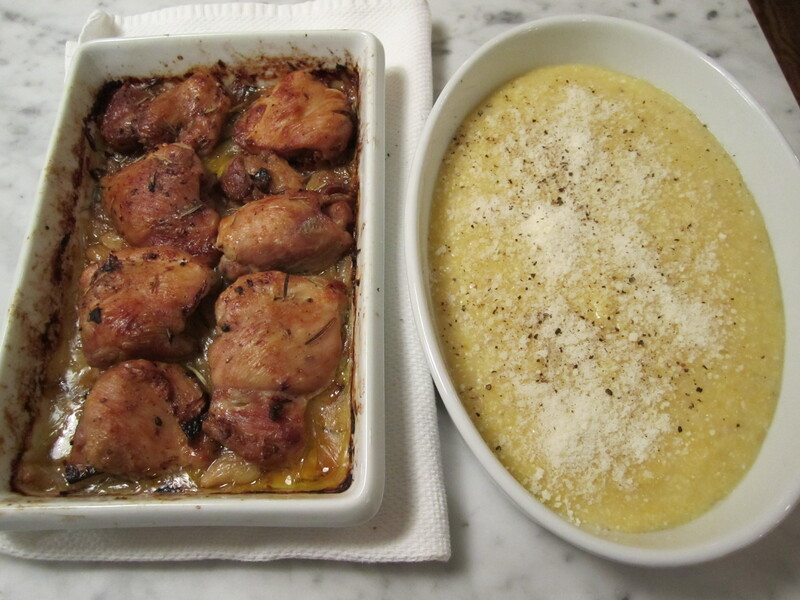 There is just enough juice in the pan to keep them moist while they bake and to spoon onto the polenta at the table. 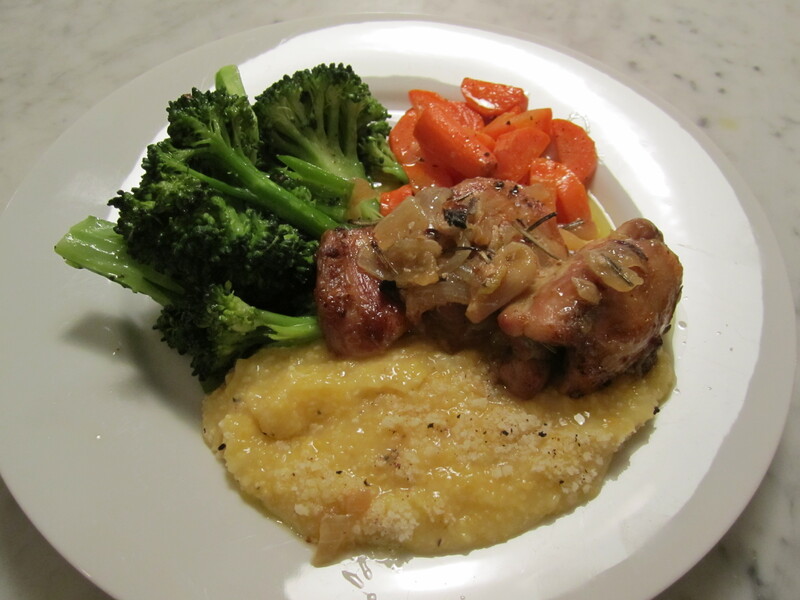 Tonight, I’m serving the dish with plain boiled broccoli and carrots, all the more to soak up the wonderful juices from the chicken and the velvetiness of the polenta. Place all ingredients in an ovenproof heavy sauce pot (preferably one with a curved bottom). Bring to a boil, stirring with a whisk. Lower the heat and continue stirring for about 5 minutes. Cover the pot and place in the oven. Stir every 20 minutes or so. After one hour, remove the pot and finish cooking and stirring on the stovetop (uncovered) until the polenta begins to pull away from the side of the pot. Taste for doneness–it should no longer taste like cornmeal and water–it should taste like a creamy porridge. 3 cloves of garlic, lightly smashed. Season the chicken pieces with salt and pepper. Place in a small baking dish with sides, large enough to hold the pieces without extra space (they can be cramped in). Add the olive oil and scatter rosemary in and around chicken. Let sit in the fridge for the day, if possible. If not, a few hours is fine. Place the dish under the broiler (but far away from the flame–at least 10″) and broil for about 30 minutes, turning often, until the pieces begin to turn golden brown and the onion and garlic begins to soften and brown. Reduce oven to 400 degrees and let bake for another 1o- 15 minutes or until the pieces are cooked through (this might only take 5 or 10 minutes), during which time, you can boil the vegetables.